Oh the wonders of cauliflower rice. Perfect in stir fries, arancini, curries… The options are endless. 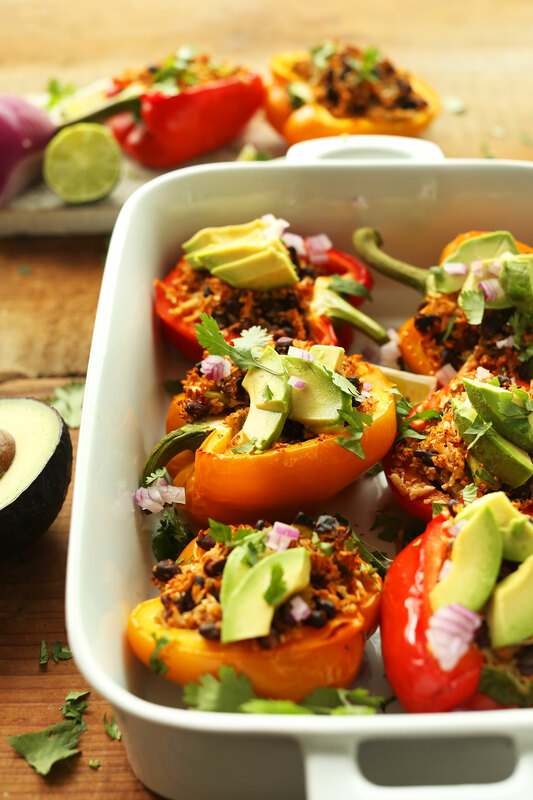 This recipe was inspired by my classic Quinoa Stuffed Peppers. I made them for dinner one recent evening, and several bites in, I speculated as to whether a grain-free version would be doable. To the drawing board I went. This recipe is simple, requiring just 10 basic ingredients and easy methods that yield big, flavorful results. Another perk of this recipe? It could easily be made ahead of time. Simply prepare up until the point of baking, refrigerate, and then bake when you need it. Even if you don’t have time to prep beforehand, the whole thing comes together in about 1 hour with just 15 minutes of hands-on prep time. That gives you plenty of time to whip up a margarita (or two), prepare my Creamy Cilantro Sauce (if you dare) for serving, and read a book (or whatever brings a thrill to your evening). See? Dinner can be that easy. 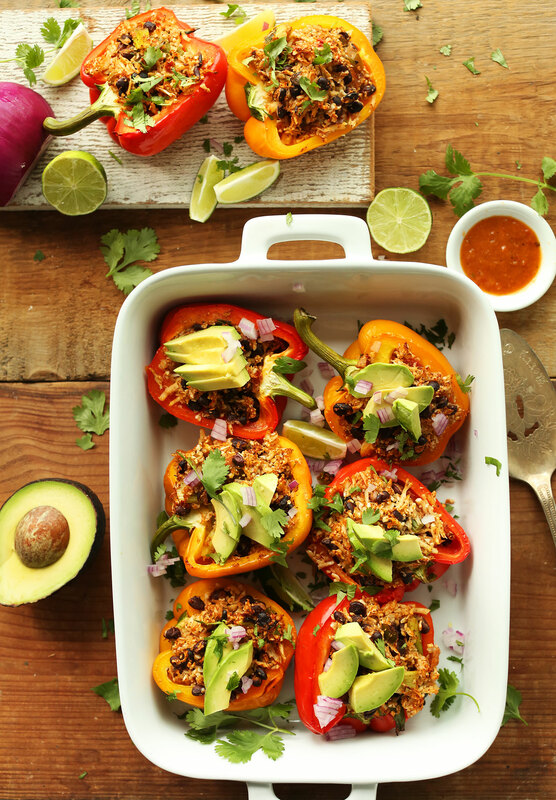 Stuffed peppers are great for serving a mixed crowd because they’re so filling and flavorful that no one will miss the meat. While they’re delicious on their own, I think they would be great paired with my Mexican Quinoa Salad and Ginger Beer Margaritas. If you need an appetizer, this Cheesy Jalapeño Corn Dip is a total win. If you try this recipe, be sure to leave us a comment, rate it, and tag a picture #minimalistbaker on Instagram so we can see! Your photos always make my day. Cheers, friends! 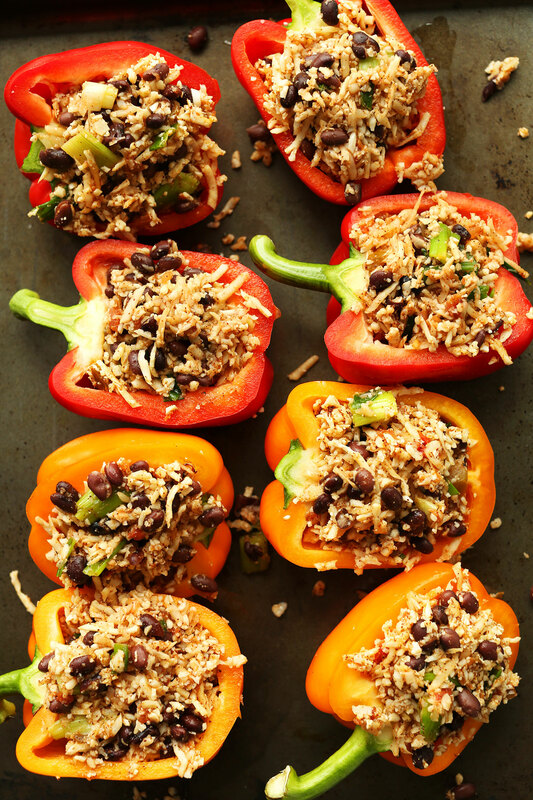 Savory, simple, 10-ingredient stuffed peppers with cauliflower rice, black beans, smoky seasonings, and salsa! A hearty, healthy, plant-based meal. Preheat oven to 375 degrees F (190 C) and set out a 9x13-inch baking dish or rimmed baking sheet. Also brush halved peppers with a neutral, high heat oil, such as grape seed, avocado or refined coconut. Set aside. Once hot, add oil, garlic (optional), onion, salt and pepper. Sauté for 1 minute, stirring frequently. Then add cauliflower ‘rice’ and stir to coat. Place the lid on to steam the rice for about 1 minute. Then remove from heat and transfer the mixture to a large mixing bowl. 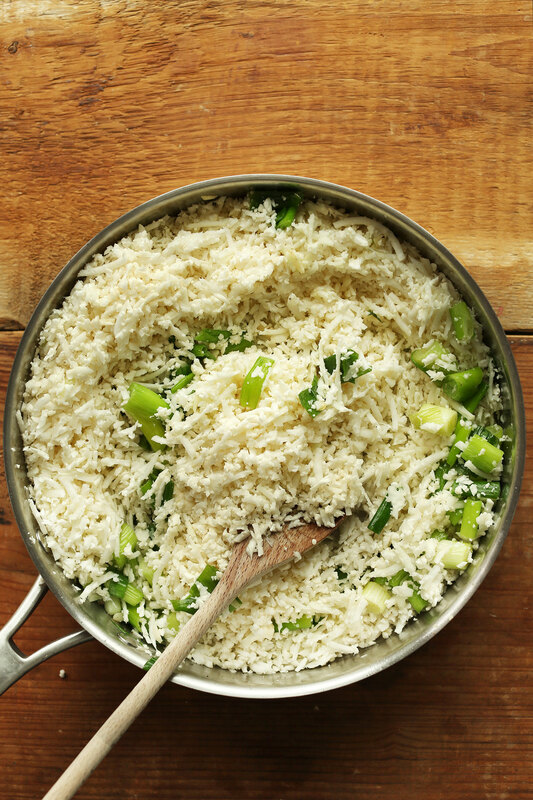 You aren't looking to completely cook the 'rice,' as it will continue cooking in the oven. 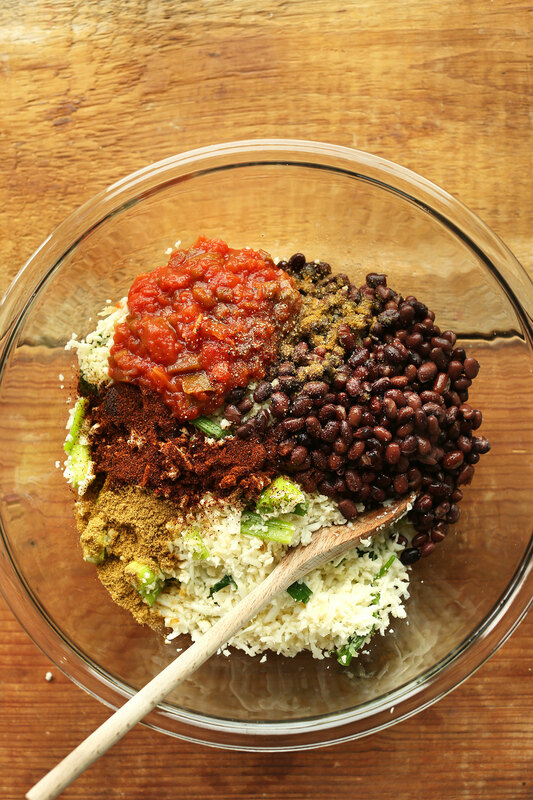 Add remaining ingredients - black beans through salt and pepper - to the cauliflower rice and mix to thoroughly combine. Taste and adjust seasonings accordingly, adding salt, pepper, or more spices as desired. Bake for 30 minutes covered. Then remove foil, increase heat to 400 degrees F (204 C), and bake for another 15-20 minutes or until peppers are soft and slightly golden brown. For softer peppers, bake 5-10 minutes more. Serve with desired toppings (listed above) or as is. I recommend avocado, lime juice, hot sauce, and cilantro. 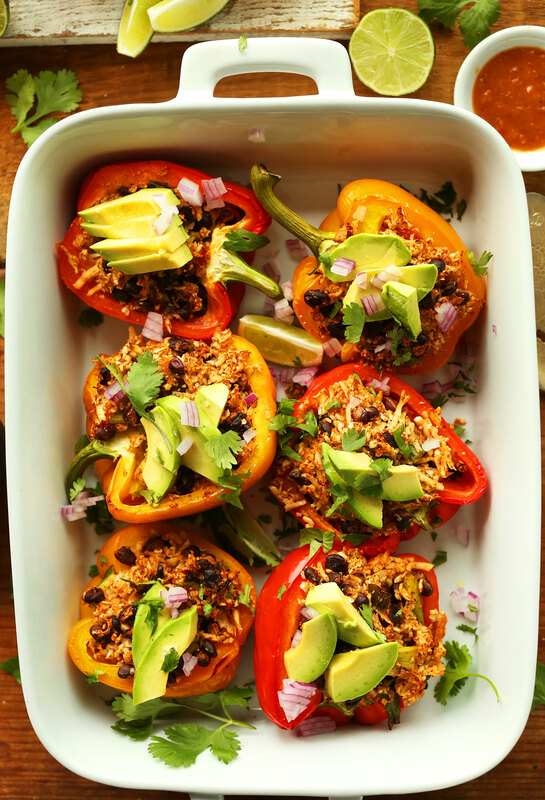 *Loosely adapted from my Spanish Stuffed Peppers with Quinoa. *Nutrition information is a rough estimate for 1 whole stuffed pepper (two halves), of 4 total servings, calculated without additional toppings. *This recipe could easily be made ahead of time. Simply prepare up until the point of baking, refrigerate (up to 3 days), and then bake when you need it. Delicious in the bell peppers or for any other use, burritos, nachos, etc. I changed this up a bit and wanted to throw it out there to anyone interested. I made this Italian style with garlic, onion, grated Parmesan (if you’re completely vegan, use vegan parm! ), green peas, spinach and parsley. I also made toasted seasoned panko bread crumb topping and added it on about ten minutes before the end of cooking time. Thank you so much for all of these incredible ideas. I am s-l-o-w-l-y going vegan and cheese is the last thing to give up so the more ideas I have to make delicious food without animal products, the better! I needed to send you the bit of observation to finally give many thanks over again for these amazing information you have provided in this case. This has been so wonderfully generous of you to deliver without restraint all that numerous people would have supplied for an e book to make some cash for their own end, particularly given that you could possibly have tried it if you considered necessary. Those secrets as well served to provide a easy way to fully grasp someone else have a similar eagerness much like mine to grasp somewhat more in terms of this matter. I believe there are some more pleasant situations ahead for people who see your blog. Made this today. I added a cup of corn to the filling. Then topped it all with your Vegan Green Chili Queso after baking it. OMG! It was so tasty!! I will definitely be making this again! As will all the recipes I have made from this site and her book, it is fantastic!!!! For my taste, I will reduce the lime juice to about 1 Tablespoon but that’s just me. Just the right amount of seasoning, great combo of ingredients and enough leftover filling for another bell pepper, or burrito! Thanks for all the great recipes using things I have in my pantry; that my whole family enjoys (and they aren’t vegan!). Thanks, Dana! My peppers came out great. I processed cauliflower in the magic Bullet with garlic, red onion, cilantro, salt, and spices. I stuffed red bell peppers with the raw cauliflower puree and baked for 45 minutes. Ahhh it came out great. Plus I made salsa following your recipe and garnish it with avocado and nutritional yeast. Fabulous! And uber healthy. Made this recipe last weekend for myself and a couple of friends for lunch. What a hit this dish was! I had some leftover stuffing so the next day I made them again only this time I added some ground beef as hubby likes his meat! Thanx for sharing this recipe. Glad it was a hit, Linda! Does this meal prep well? and if so how many days out before it’s past its prime? I made this last night and it was a big hit, but takes a long time, even though I used the bagged cauliflower rice from Trader Joe’s (which I highly recommend by the way). Next time I make this recipe, I am going to deconstruct it. Rather than stuffing the peppers, I am going to dice one or two peppers, sauté the whole dish, and serve it that way. I think it will save me at least 40 minutes! I may even microwave the cauliflower first. Thank you for this fantastic recipe. The flavors are such a nice change of pace and my husband was really happy. He is the one who recommended “unstuffing”! I made this today – I stuffed 3 peppers and 3 tomatoes. Taste as you season, it’s fairly bland so I used a lot more chili powder and cumin – about 5 tablespoons chili powder and 2 tablespoons cumin. I also used 4 cloves of garlic. I used Herdez salsa. It was really good. The peppers were good but the tomatoes were fantastic. A great grain free meal, super easy. This is going to be added to the weekly meal rotation. Hey this looks amazing! Is there a time to use a crock pot? I love using it over my oven since the temp is never accurate. Thanks! Definitely gonna try this at some point though, hopefully sooner with crock pot times! My mom and I made these for family dinner the other night and they were great! I wouldn’t change anything about the recipe. I think one important note is to make sure the grater you use isn’t too small, so that when your cauliflower cooks it won’t be mushy. But the flavors were great and I served them topped with salsa, herb cashew sour cream and fresh cilantro. Dana, you never fail when it comes to easy, yet tasteful, plant-based recipes the whole family will love :) Thanks! I made it for my New Year’s Eve party. Everybody besides me eats meat, but this peppers disappear so fast, everybody loved it ! I heard so many compliments ;) Amazing recipe ! Flavorful ,colorful , easy , cheap and delicious ! It was my first recipe from this website and I;m captivated. Can’t wait to try something more. Thank You. In love with cauliflower rice after making this. My only issue was how spicy it was. I think the chili powder and salsa combo I chose was a bit too much. I would recommend cutting the chili powder in half or using a very mild salsa. Next time. Good tip for those that don’t like it quite as hot. Thanks, Shy! Super good, CAULIFLOWER rice is my new fav. I made this tonight! I wish I could post a photo! It was full of flavor and a definite hit! I always have to alter recipes! That’s just me! I added in organic fire roasted corn, cilantro, and peeled, chopped raw tomatoes. After baking, I topped with avocado, lime juice, green onions, and cilantro! Thanks, Dana! I made this recipe tonight, using bell peppers from my garden. I cut the olive oil in the recipe down to half a Tbsp . We are not vegetarians, so also I added 8 oz cooked ground turkey breast. Both my husband and I thought it was awesome! I topped each half with a tablespoon of shredded cheddar cheese about 3 min before coming out of the oven. I made this last night for the whole family and it was beyond delicious! Thank you!!! This is delicious!!! Made it tonight and it was so good. I took a cue from your Spanish stuffed peppers and added a bit of vegetable broth to the cauliflower rice for more flavor. Love it! Made these last night along with your hummus recipe – both were delicious. I have only just “found” you and can’t wait to try more of your recipes . Super good! Comes together easily. I made this after googling cauliflower and pepper and was surprised how tasty this was. Really good stuff, will make again! Top marks. This was an awesome recipe. My kids loved it (well, they weren’t in love with baked pepper… but they loved the inside!)! I loved that this is plant-based — the flavor was perfect. The only thing I would say is…. I think 15 minutes for prep is slim! I may be slow in the kitchen in between 4 kids — but even if I had no distractions, I don’t think I could have had all of this put together ready for the oven in 15 minutes. Especially if you’re figuring in starting with the cauliflower from scratch. Still an easy recipe though! And so YUM! Just started eating Vegan food about two months ago and was getting sooooo bored with rice and beans … thankfully I found your website, made a few recipes already and they all have been life changing!!! These stuffed peppers were AMAZING ..made them with the cilantro dressing exactly as stated and wow!!! Can’t wait to cook now that I have so many wonderful options!!! THANK YOU SO MUCH DANA!!!!!!!! Just prepared this last night and can’t wait to try it. Very simple and it smells so good!. These look so yummy! If I buy riced cauliflower at Trader Joe’s how much would I use for the recipe? Made these today and WOW! Just so flavorful, healthy and easy to make! I lovvvvve cauliflower rice too! Do you brush the oil on the inside or outside of the pepper? Or both? You can do both I just do the outside. The lime and avocado make a huge difference. Thank you again. Increasing veggie intake is easy with your great ideas. I just wanted to say thank you for this recipe. I made it this evening and it turned out divine. Grating the cauliflower was a bit messy but the recipe was worth the effort. I had made a green tomato salsa earlier in the day and I used that in the recipe. Delicious. I appreciate you providing recipe tips – can make all the difference in a recipe being a success or a failure if you’re not used to working with certain ingredients. Keep up the great work. I’ll be coming back for more of your tasty creations. 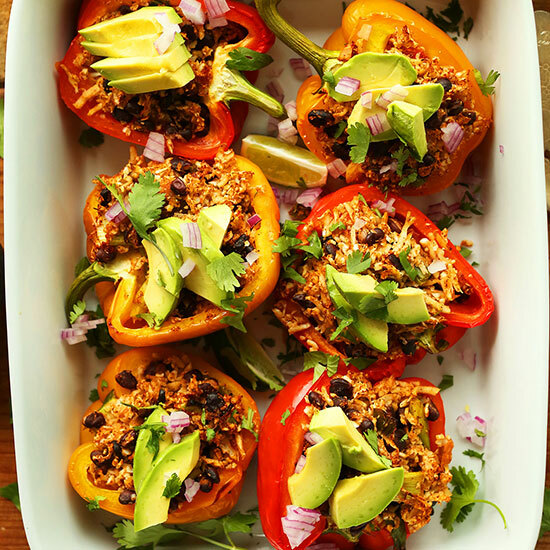 Do you think mini peppers could be used in place of large ones, to make this an appetizer? If so, would you alter the baking temps/times at all? Thank you for all of your delicious recipes…you have made me a favorite person to invite to potlucks. Every single recipe I make from your blog or your book turns out amazing. This was so good especially since there is an abundance of peppers! You really took my Vegan lifestyle to a whole new level. SO delicious! We’ve already made it twice with red peppers. We made no changes to the recipe at all, it’s fabulous as is. The second time we made it, it was for some friends who came by for dinner. One of them was really not excited about the cauliflower in place of actual rice, but he ended up loving it so much that he ended up stealing all the leftovers to take home. Recently became vegan and this recipe is one of those recipes that make me so happy with my decision. Very easy and so much flavor! I’ve made it twice now and one of three times I used quinoa instead of cauliflower rice. Highly suggest this recipe! Gave the recipe a go tonight and surprisingly the family was thrilled! No leftovers! Anytime I even hint at a dinner thats even remotely healthy, I get nothing but groans! But tonight the positive feedback was overwhelming! Thanks Dana! Prepared this last night, and it was so delish!!! Ate the leftover rice and beans on a tortilla with your Greek guacamole! These look so incredibly colourful and delicious! I’ve made these twice already (though I had to skip the beans, which makes me v. sad) Another winner!! Thank you for this delicious recipe! I hate cauliflower but with salsa and cilantro and avocado, I can’t taste it all. I did caramelize my onions prior to adding the cauliflower, I like the sweetness that it adds. Looks yum! Need to try this out. Made this last night and WOW! This will be one of my go-to recipes. The cauliflower rice was super simple to make in the food processor and tasted amazing compared to rice. Considering the calorie difference, this is now one of my favorite substitutions. I also microwave one ear of corn/charred on my stove top before adding the kernels to the mix. Anyone else reading this, please do yourselves a favor and make the cilantro dressing she linked to in this recipe. What a beautiful addition! fyi trader joe’s now has vegan marshmallows and i think they’re just as good if not better than dandies. Ah! I can’t find them! Hoping they come in stock near me soon. This recipe couldn’t have come at a better time with a cauliflower and two red peppers sitting in the fridge, desperately needing to be used up. Cool idea, can’t wait to try this stuffing mix out with a range of veggies! Hi Dana, this looks absolutely delicious and I must give it a try. I actually started to drool whilst reading the ingredients. Thank you for sharing! This looks delicious ! I’m going to try it for sure ! This looks so yummy! I’m so excited to make it for dinner! It look very flavorful and filling! This looks so great! It’s going on the next meal plan for sure! Looks delish! I grabbed a bag of cauliflower rice the yesterday, not knowing what I was going o do with it, now I know. Just got on the cauliflower rice train and realized it could be purchased at the store! Wife tried to make it at home and it was a bust. Eye popping color. Gorgeous. Like the stems left on.